Siddaleah's Tarot Journal: Death Can Be Funny! Funny! I did a daily spread, and for "my role" I pulled Death reversed. I was thinking, "Hmm, new beginnings, change, maybe even stagnation?" Then I just looked at the card and it struck me how BLOODY it looks. Today is the second day of my period, which is when I typically experience a very heavy flow. When I read the guidebook that came with the Revelations deck, the stuff around the baby was described as "bloody tendrils." LOL! So, my role for the day was to curl up in the fetal position and bleed. 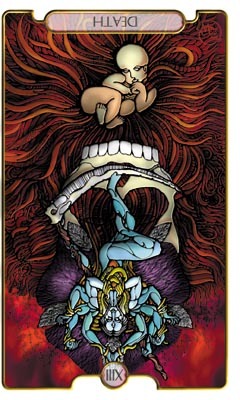 I love how literal and funny tarot can be at times.